On June 20, 1964, Civil Air Transport (CAT) Flight 106, C-46D B-908, took off from Taichung’s Suinan (水湳) Airport at 1735 hours but went down five minutes later near Shen Gang (神岡) in central Taiwan. All 52 passengers (including 19 Americans) and the crew of 5 aboard were killed. This is not only the first ever major accident involving a civilian airline in Taiwan, but also very likely the result from a hijack attempt. However, an attempted hijack was suspected because two .45 pistols were found in the wreckage as well as two radar manuals whose inside pages had been carved out in the shape of a pistol. Taiwan’s Digital Archives preserve the newsreel footage clips of the recovery effort, subsequent funerals, and the press conference held by Taiwan Provincial Police Department. The guns and radar manuals can be seen at about 18 seconds into the second video. Because CAT was partially owned by CIA, the Agency also took part in the investigation. In 2009, CIA released several documents related to the investigation. This cable from the American Embassy in Taipei to State Department included some names of the Americans killed in the crash. Also available is a compilation of various reports. But I think the report titled A Report on B-908 Aircraft Crash Accident Viewed from the Angle of Aviation Medicine, authored by CAT’s company doctor W.S. Cheng, M.D., is most interesting. Unfortunately, the question of the two guns were not covered in the documents released by CIA. 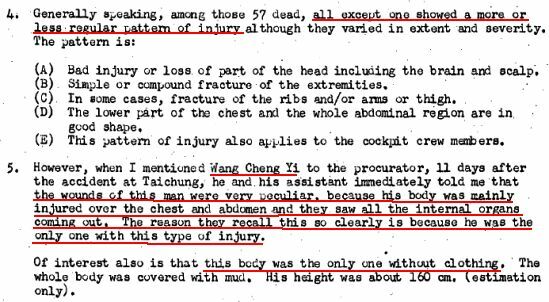 Although the documents did not name the suspected hijackers, Doctor Cheng’s report devoted quite a few paragraphs to two men, Tseng Yang (曾暘) and Wang Cheng Yi (王正義), especially Wang. Could the spike found in the ashes of the co-pilot M. H. Kung a melt .45 bullet? This report is, to my knowledge, the first information to become available after being ‘classified’ for 50yrs. I am interested in gathering more information on the above incident in which 57 died (including my mother). It was deliberately recorded as being pilot error.